Literally meaning, Lak Mountain, after one of the main peaks in this mountainous region of southwestern Thailand, Khao Lak offers travellers serene beauty, white sand beaches, towering cliffs and a less touristy alternative to other Andaman superstars like Phuket and Railay. This is definitely one of the best places to visit in Thailand! This is where most liveaboard dive boats leave for long scuba trips in the Similan Islands. It’s home to some excellent beaches, national parks, waterfalls and hikes and it’s just 60 kilometers north of the uber-popular Phuket Island. Khao Lak was hit hard by the 2004 tsunami and the disaster still weighs heavily on the residents here, as made evident by the impactful Tsunami Museum which sits in the center of town. Over 4,000 people were recorded dead after the waves hit and 3,000 more remain unaccounted for, but somehow Khao Lak has bounced back. The people here have regained the loving smiles that make Thailand famous and the tourism infrastructure has been rebuilt, with new escape routes and warning systems in place so that any future disaster will be better handled. I wouldn’t call Khao Lak “off-the-beaten path”, but it definitely is one of the more laid back beach towns on the Andaman coast. There are lots of accommodation options for every budget and it’s in a great location, perfect for trips to the Similan Islands, the Surin Islands and the Khao Lak / Lam Ru National Park. 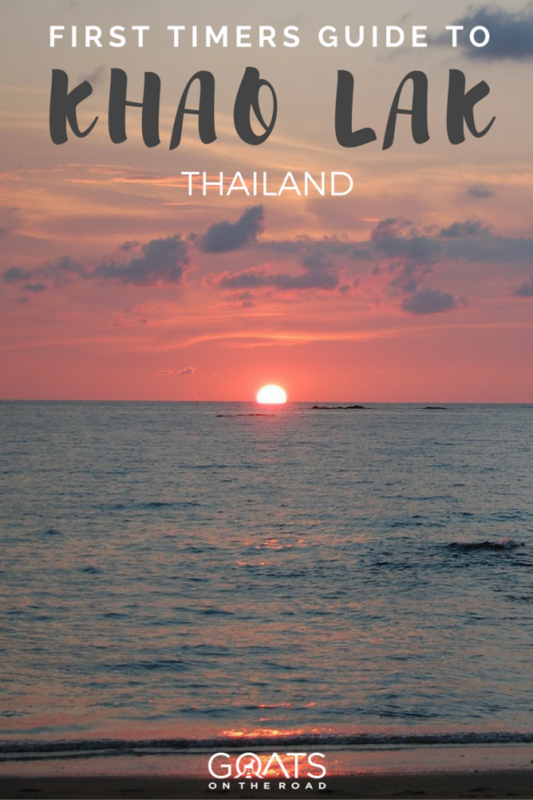 In this guide I’m going to break down everything you need to know about a trip to Khao Lak, including how to get there, the best places to stay and eat and the best things to do, as well as day trips around the region. 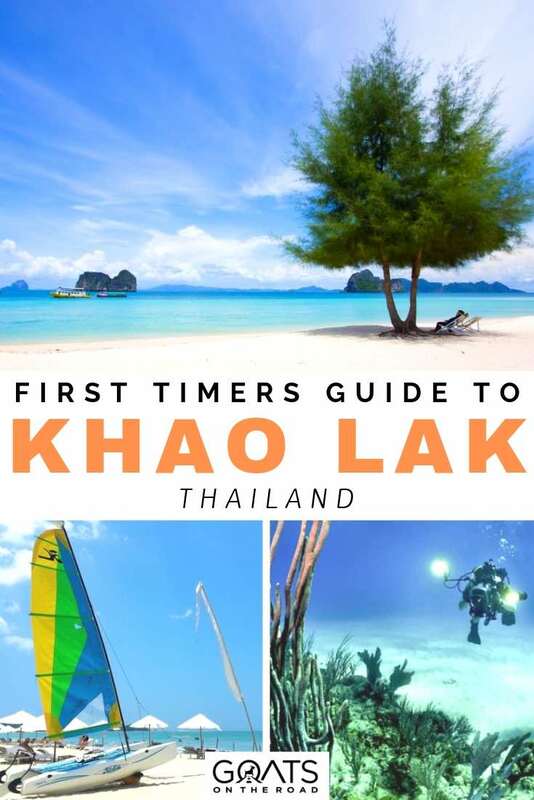 If you’re planning on heading to Khao Lak, look no further than this essential insider’s guide. Things To Do in Bangkok – 13 Things You Don’t Want To Miss! Things To Do in Chiang Mai – Top 17 Things You Don’t Want to Miss! There are numerous ways to get to Khao Lak. Although the area has an island vibe, it’s actually on the western coast of mainland Thailand. Similar to Railay Beach, Khao Lak does feel somewhat seluded even though it has roads leading in and out, making it considerably easier to reach. Travellers coming to Khao Lak by plane will land in either the Phuket Airport (HKT) which is around 80 km outside of town or the Krabi Airport (KBV) which is 140 km from town. From the former, a minibus will take you from the airport to Khao Lak in just over an hour for around $3 (100 THB), or you can take a taxi for $37.50 (1,200 THB). From Krabi Airport you can book a shuttle bus to take you to Khao Lak for just over $5 (160 THB) while a taxi will run you over $50 (1,650 THB+). There are multiple flights leaving daily from the airports in Bangkok to both of these airports. The best airline in the region is AirAsia, but you can also find flights with Thai Lion, Nok (not recommended), and Thai Airways. The cost to Phuket or Krabi will likely be between $50 – $70 per seat. To reach Khao Lak by train from Bangkok you’ll have to get off at the Surat Thani Station. This journey takes around 12 hours and will cost you around $15 (500 THB). From Surat Thani Train Station you can hop on a 3 hour bus for $5 (150 THB). If you’re renting a car in Thailand, you can drive from Bangkok to Khao Lak along Route 4. The drive will take you around 10.5 hours. There are buses from Bangkok to Khao Lak and they usually cost between $15 (500 THB) to $30 (1,000 THB) depending on the class you choose. The journey will take around 13 hours. Being a beautiful beach area with lots of stretches of white sand, rocky outcroppings and turquoise green waters, it may be hard to peel yourself away from the coast, but if you do decide to leave your lounge chair, there is plenty to keep you busy in the region. See how much faith I have in you leaving the beach? So little that I’m starting the things to do with some wonderful beach walks in the region. The main stretches of sand are Nang Thong Beach and the strip in front of La On Village. They’re very close to the main shopping and restaurant areas so you don’t have to go far from your guest house to get to them. 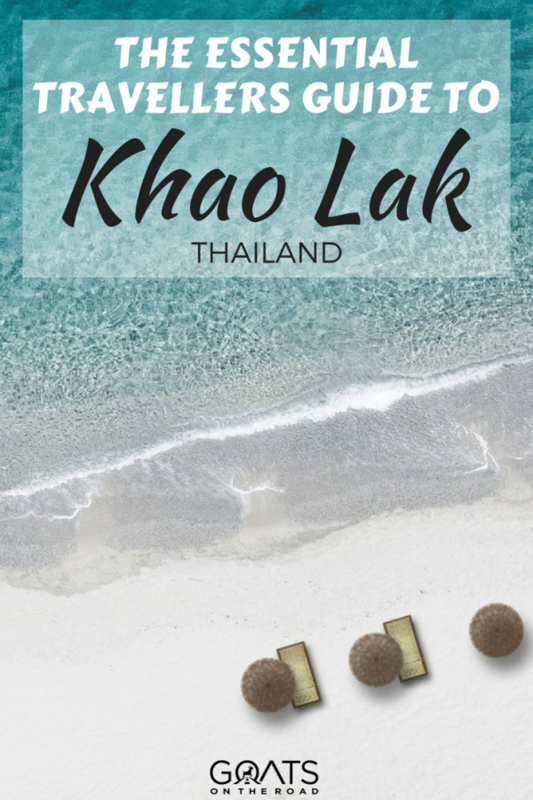 If you want to go a little further afield, check out Khao Lak Beach itself which is 5km away from La On or Bang Niang Beach, Hat Pakarang, Hat Bang Sak or Pak Week. All are beautiful and you could easily spend an afternoon at each one of them. The perfectly clear waters and dramatic rock formations of Phang Nga Bay set the scene for the famous James Bond movie The Man With The Golden Sun, and also make for the perfect place for a day trip from Khao Lak. The lovely national park has amazing ocean scenery, stunning green and blue waters that almost appear to be lit from below, and lush jungle greenery. Check to see if your day trip includes a trip to Ko Panyi, a stilted village, and a canoeing trip. With the dazzling Similan and Surin islands lying offshore offering some of Thailand’s best diving opportunities, Khao Lak is the place to join a liveaboard. 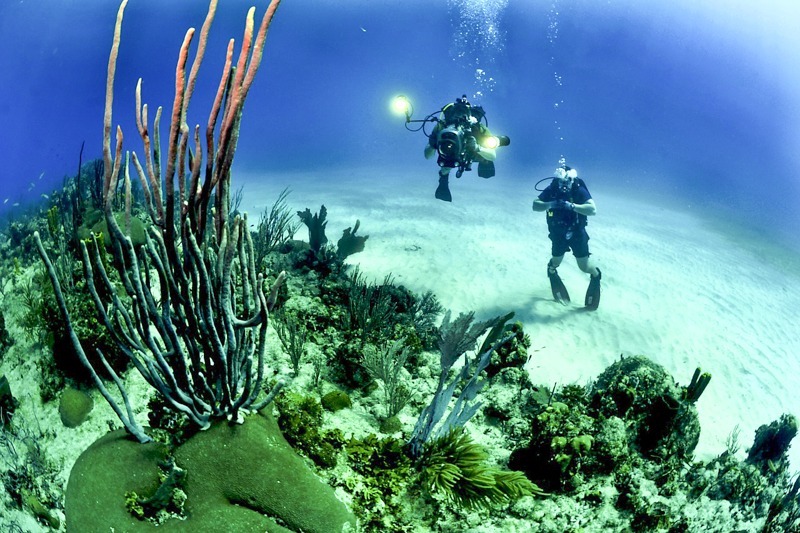 There are plenty of companies offering multiple day excursions out into the coral reefs and most can be booked from tourism agencies, guest houses and dive shops in town. If you’re into wreck diving, you really can’t beat the eerie and amazing sunken giants like HTMS Prathong, Premchai, MV Sea Chart and Boonsung. Joining a liveaboard trip is one of the most incredible things to do in Thailand. There really is no limit to the beauty of this amazing national park. Home to countless species of flora and fauna and some wonderful camping areas, this 735 square kilometer natural reserve is smack dab in the middle of the Andaman and Gulf coasts. Plan a full day trip or a multi-day camping and trekking excursion in the national park. Many tour operators in Khao Lak can help you book a trip and expect to find exotic creatures like tapirs, barking deer, macaque, gibbons, and even wild elephants (if you’re lucky). Escaping to a nearby waterfalls is a good way to see the raw nature near Khao Lak while cooling off in crystal clear pools. Don’t miss the five-tiered tumbling waters of Lam Ru or the pools of Khao Lak Lam Ru and Ton Chong Fah. It’s best to pack a good pair of hiking shoes on a day to waterfalls because the rocks can be incredibly slippery near the pools. Bug spray is also a good idea for those jungle mosquitos. The International Tsunami Museum in Khao Lak showcases the facts and horrors of the devastating 2004 Boxing Day Tsunami. Still the most lethal natural disaster in history, the aftermath of the 9.1 magnitude earthquake off the coast of Indonesia sent 9 meter high waves that wreaked havoc around the rest of the region in their path. The museum educates visitors about how tsunamis are formed, warning signs to watch out for and how to escape to safety quickly. It also tells amazing tales of survival and tragedy. A visit to the museum is a visceral experience and a must for those interested in natural phenomena. If you look on sites like Airbnb and Booking.com you can find some great deals on accommodation for all budgets. Click Here to check out the top rated places on Booking.com, and if you’re backpacking Thailand, you’ll be happy to know that many of them are under $30 per night. Whenever in Thailand, it’s hard to keep yourself to just three meals a day. Light, refreshing, salty, spicy, sweet and sour, the cuisine in southern Thailand is excellent and Khao Lak is a great place to try regional dishes and tasty seafood preparations. Located just 20 minutes from Khao Lak Beach, this giant night market opens up every Wednesday and Saturday and is host to a ton of amazing Thai food. From the scrumptious to the strange, you can try everything from Pad Thai to grilled insects at this exciting night market. Even if you don’t decide to eat here, you should check it out as it could’ve easily been listed under “things to do” in this guide as well. If looking for a tasty seafood barbeque and you’ve got a little bit of extra Baht to spend, then don’t miss Sala restaurant and Khao Lak Seafood, which are both located on Phet Kasem Rd in Bang Thong. Both restaurnats have a nice setting and great bars and offer generous portions of consistently fresh and well prepared seafood with Thai dipping sauces. It’s worth planning your visit to the Andaman coast during the high season or shoulder season because the rains are very heavy in the off season. 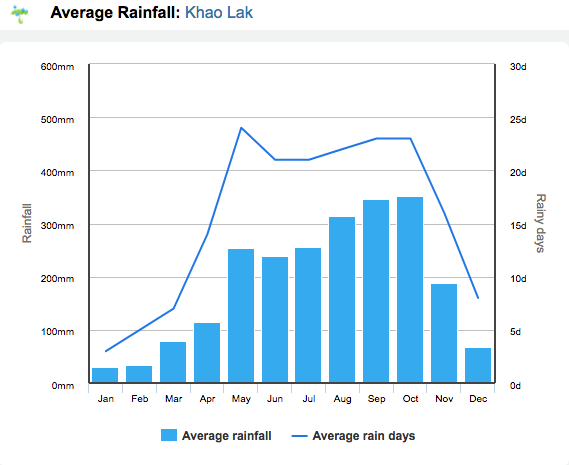 The dry season runs from November to April and the wet season from May to October. Even in the Dry Season though you will get rain, particularly at the beginning and end (shoulder), but there is a considerable amount of downpour in the rainy season between May and October. During this time you’re better to be in the Gulf of Thailand (Koh Samui, Koh Tao, Ko Phangan etc.). Although Khao Lak is a little bit more expensive than some other places in Thailand, visitors here are rewarded with a laid back alternative to Phuket, with lots to see and do both in town and in the surrounding national parks and beaches. 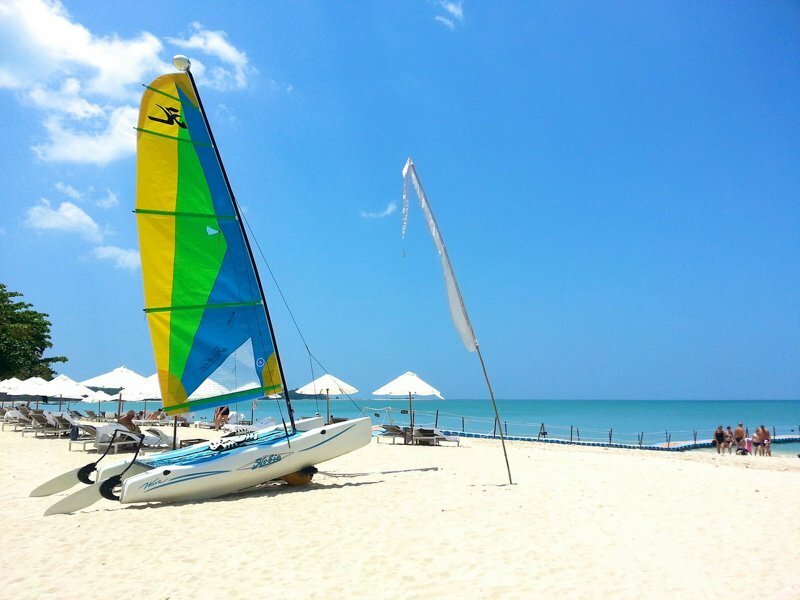 You could easily make Khao Lak your home base while exploring more of the Andaman Coast, returning after each excursion to enjoy sunset on the powdery sands. No matter how you spend your time on the west coast of southern Thailand, try to make sure that beautiful Khao Lak is on your itinerary. 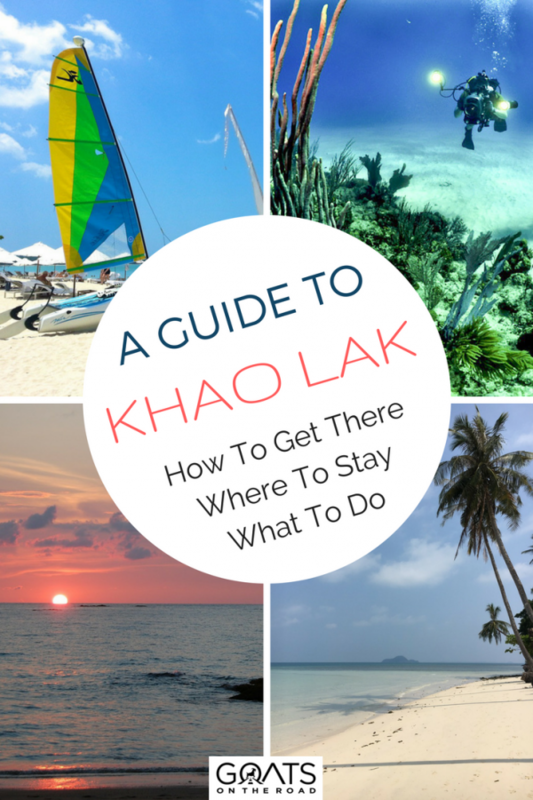 Khao Lak sounds like a great place to go on vacation! Khao Lak is great! Nice detailed article, would love to go there again.